The Learning Room in Creatures 3 is the area where Norns are taught words of the Handish language (as opposed to bibble). It has one door to the Norn Terrarium, which is the only entrance or exit. It contains a cheese machine and toys for feeding and occupying baby norns during the learning process. 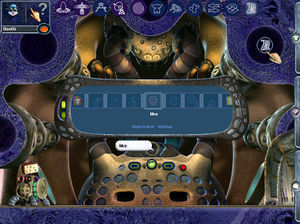 The Learning Room, with the Learning Machine demonstrating the word "Like"
This page was last modified on 7 October 2016, at 03:02.